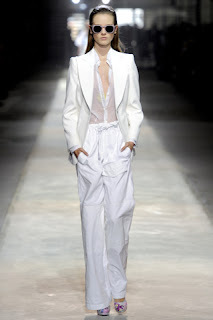 The dreaded pantsuit.....what does that bring to your mind? Perhaps images of 80's women in pleated royal blue pants and double breasted blazers ? Or maybe it's a woman in a boxy black pantsuit attempting to fit in with her male counterparts? If so, you NEED this post. My career background has fluctuated from attorney to luxury fashion retailer and I have certainly learned some lessons along the way. 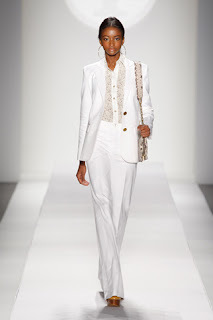 One of which is, a woman's greatest asset is her feminity....so, let's all agree not to hide it in a boxy pantsuit! Instead, select a perfectly tailored suit that makes you feel beautiful and powerful. 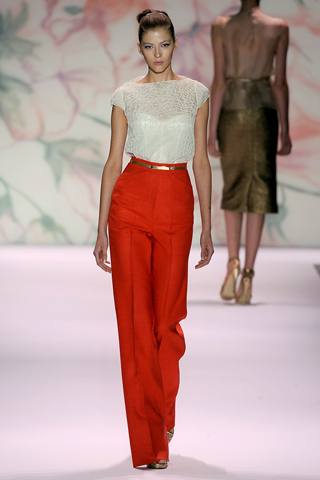 The great news for us working gals is this spring season, unlike years past, designers really embraced the pant. 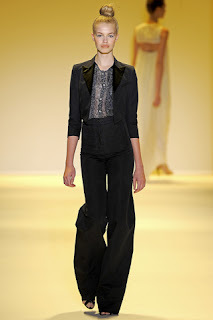 Perhaps the biggest trend on the runway was the wide leg pant. This style is universally flattering and would be perfect paired with a fitted blazer and a beautifully femine blouse. Classic white wide-leg suit, perfect for spring! I hope you enjoy our "working girl" posts. Be sure to check back each Tuesday for chic work wear ideas. Also, I would love to hear your thoughts and what posts most interest you. That's exactly how this series was created....by request! Just think of me as your personal stylist! Have a lovely evening, meet you back here tomorrow.